that’s being tapped to help safeguard a favorite crop. 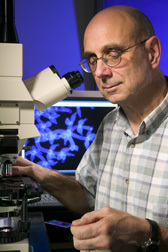 Mycologist Gary Samuels views endophytic Trichoderma species through a microscope. The endophytes can be seen on the screen in the background. There may come a day when it will seem almost naive to identify a plant simply by genus and species. That’s because if you were to zoom in on, say, an oak leaf and view its clusters of tiny cells bunched up alongside one another, you’d see that those cells are not alone. Cozying up next to them, between them, and on top of them are cells belonging to a vast array of fungi. Called endophytes, they live inside leaves, roots, and even bark without harming the plant. While plants and fungi have likely been entangling themselves for thousands of millennia, scientists are just beginning to understand the exact nature of their unusual relationship. Gary Samuels is an ARS mycologist who’s blazing paths in this new fungal frontier, helping to identify endophytes that he and his colleagues collect on fungi-hunting missions around the globe. In some cases, he’s naming species for the first time. 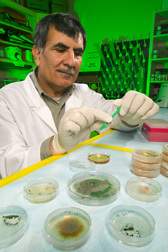 Samuels works at ARS’s Systematic Botany and Mycology Laboratory (SBML) in Beltsville, Maryland. Currently, Samuels, along with SBML colleagues and other international fungi experts, is interested in endophytes that live in cacao trees, the plants that produce cocoa for making chocolate. They’re looking to see whether these fungi can bolster the tree’s health and defenses against persistent diseases that threaten its cherished fruit. For chocolate lovers, life has never been better. A vast selection of chocolate—milk, dark, and even extra-dark—is now available in groceries and health-food stores. And scientists, including those with ARS, are finding that cocoa’s phytochemicals may protect the body’s cells from oxidative damage. Conventional control methods, including chemical fungicides, are failing to curb the diseases’ progress. These seemingly unstoppable pathogens not only threaten future world cocoa supplies, they also imperil the livelihoods of small farmers trying to raise a cacao crop. 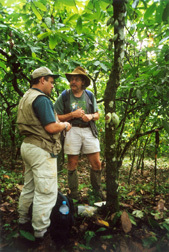 Samuels has named and described one endophyte that’s showing good promise as an all-natural cacao-disease controller. It’s called Trichoderma ovalisporum. “Trichoderma are soil fungi that are already known for being effective biological control agents of soilborne plant diseases,” he says. According to Evans, scientists have the best chance of uncovering beneficial endophytes by searching in a crop’s area of origin, especially in its wild populations. Wild cacao, for example, harbors rich communities of live-in fungi that are missing from cultivated cacao. So far, laboratory and field studies show that T. ovalisporum can curb growth of the fungal spoiler that causes frosty pod rot disease. If the endophyte continues to prove its worth as a protective agent, its spores could be applied as a spray to cacao tree flowers, Samuels says. Samuels also described the fungus T. stromaticum, which researchers recently discovered is an endophyte. This organism is so effective at stamping out witches’ broom that it is the basis for a Brazilian product, Trichovab, being used to foil the disease-causing fungus in some parts of the country. 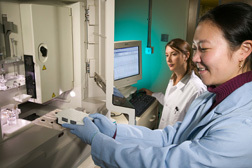 Technician Cindy Park (foreground) loads fungal endophyte samples into a genetic analyzer. Mycologist Cathie Aime examines the raw DNA sequence data, which will be compared to known sequences to aid in identifying the endophytes. Another SBML fungi expert, Cathie Aime, is also busy finding and naming endophytes that could help protect the cacao crop. Recently, she helped identify 60 fungal isolates that were taken from the stems and pods of cacao trees in forests in Latin America and West Africa. Many of the specimens she analyzed turned out to be basidiomycetes, a group of higher fungi that have gills. The classic “pizza” mushroom is an example. And Aime hasn’t stopped at naming cacao tree endophytes; she’s also bringing identity to hordes of endophytic fungi living inside coffee plants. Fernando Vega, an entomologist with ARS’s Insect Biocontrol Laboratory in Beltsville, is working to stem the coffee plant’s major foe—the coffee berry borer. He asked for Aime’s help in identifying some 900 fungal isolates taken from coffee plants in Hawaii, Colombia, Mexico, and Puerto Rico. Samuels and Aime will continue to bring identity to this uncharted world of plant-inhabiting fungi. And while the notion of one organism living inside another might seem bizarre, Samuels says it really shouldn’t. “Look at humans: We have fungi and bacteria living in us. Just think of all the beneficial microbes living in the human gut.”—By Erin K. Peabody, Agricultural Research Service Information Staff. This research is part of Plant Diseases, an ARS National Program (#303) described on the World Wide Web at www.nps.ars.usda.gov. Gary J. Samuels and M. Catherine Aime are with the USDA-ARS Systematic Botany and Mycology Laboratory, 10300 Baltimore Ave., Beltsville, MD 20705; phone (301) 504-8279 [Samuels], (301) 504-5758 [Aime], fax (301) 504-5810 . "The Matrix—Plant and Fungal" was published in the June 2006 issue of Agricultural Research magazine.